We have been feeding our dogs Orijen brand dog food for several years. There seem to be a lot of dog food commercials lately asking you if you know what is in your pets food and I am very confident that Orijen stacks up just as well, if not better, then those foods being advertised. The dogs really seem to enjoy it, it is high protein and organic, and I really liked that it is produced locally in the town of Morinville, just outside Edmonton. We ran out of dog food this past weekend so I made a quick trip to the pet store to pick up a bag. While there, I was excited to see Orijen now has a line of dog treats out and decided to pick up a bag for the dogs to try. 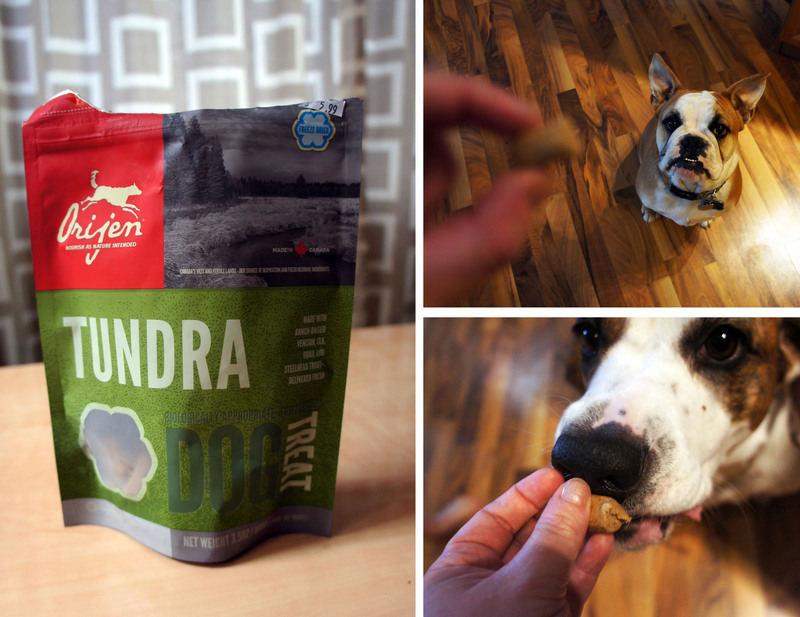 There are 8 different flavors, and I ended up going with the Tundra – a mixture of freeze dried elk, quail and trout. Nova has been picky about her treats lately and will barely touch a milkbone, so I was so happy to see she snapped these right up. Judging by both dog’s enthusiasm when I now reach for the bag, I would say they are a winner and will continue to be a doggy staple in our house. I love that I can offer them some variety with all the different flavors, and I am so happy to have found something I can use again to entice Nova downstairs when needed!